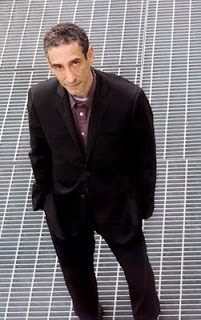 This is the photo of Douglas Rushkoff I posted with my 2011 interview of him. Douglas Rushkoff and more than two dozen other writers and artists have signed an open letter asking the Senate to move forward on NSA reform. (The House has passed reform measures, but so far the Senate has done nothing.) Some of the 28 other letter signers are more famous than Rushkoff, but obviously none of them is cooler. As writers and artists, we join PEN American Center in urging Congress to act to end mass surveillance. We recognize the need for strong protections for U.S. national security, and acknowledge that such measures will sometimes entail difficult tradeoffs. However, the NSA’s shockingly broad and indiscriminate surveillance programs threaten our most cherished democratic ideals and violate our constitutional and international human rights to free expression and privacy. The Washington Post’s recent report that nine out of 10 individuals whose communications are being intercepted are not the intended targets of investigation underscores the total lack of proportionality of NSA mass surveillance, and the need for reform. It has been more than a year since the public first learned of the vast scope of the NSA’s surveillance regime. Immediate reform is necessary to restore our historic and treasured balance between government protections and individual freedom. Mass surveillance invades our private thoughts and lives, chilling speech and spreading fear and mistrust throughout a society. Mass surveillance is censorship: An October 2013 survey of U.S. PEN members, the majority of them writers, indicated that one in six are self-censoring—refraining from writing or speaking on particular topics—due to concerns over NSA surveillance. As over 500 of our fellow writers noted in an open letter published in the Guardian in December 2013, “In their thoughts and in their personal environments and communications, all humans have the right to remain unobserved and unmolested.” Writers and all citizens need privacy to explore controversial ideas, conceive challenges to conventional wisdom, and to enter into open dialogue with counterparts around the globe who may enlighten our worldview through their very different beliefs. NSA mass surveillance poses a grave threat to the United States’ proud tradition as a champion of free expression. Congress must act now to protect our freedom to speak, think, write, and create freely—and in private. · Strengthens transparency provisions allowing private companies to disclose information about government orders received. There is much more to be done, but enacting strong legislation on these four points would send a clear message that Congress recognizes the need for reform and is committed to ending mass surveillance. We call upon Congress to take immediate action to protect the rights of all to privacy and free expression.